The Department of Justice (DOJ) inspector general has located the missing messages between anti-Trump FBI officials Peter Strzok and Lisa Page, according to a letter sent to congressional committees on Thursday and obtained by CNN and Fox News. 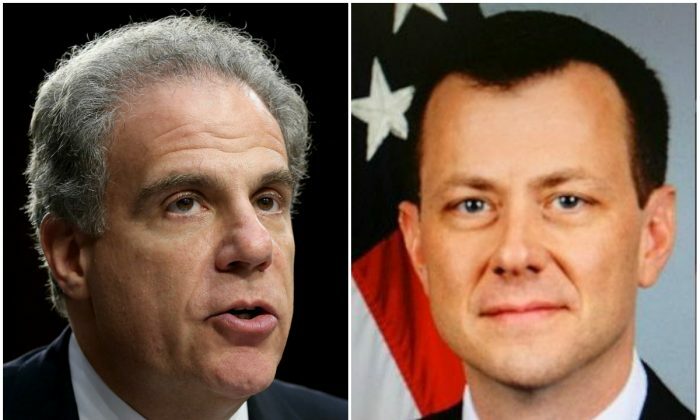 The inspector general’s investigators recovered at least four phones that belonged to Strzok and Page in order to recover the messages, Fox News reported. The missing texts between Strzok and Page are at the center of a heated controversy after the DOJ informed congress members that five months’ worth of messages could not be recovered. President Donald Trump highlighted the missing texts as “one of the biggest stories in a long time” and Attorney General Jeff Sessions said that the DOJ “will leave no stone unturned” to recover the messages. Strzok and Page first came under intense scrutiny after their anti-Trump texts were made public. Months before the messages were made public, Strzok was removed from Special Counsel Robert Muller’s Trump-Russia probe over the same messages. In the messages, the pair discussed an “insurance policy” in the unlikely event that Trump was elected. Lawmakers who are reviewing additional messages between Strzok and Page, mentioned that the two, who were having an affair at the time, discussed a “secret society” in their messages. According to an informant cited by Sen. Ron Johnson (R-Wis.), the secret group consisted of top-level FBI and DOJ officials who held secret meetings offsite. According to a high-ranking FBI official who spoke to True Pundit, messages and emails among top FBI officials contain conversations about initiating physical harm against the president. The discovery of the “missing” texts come at around the same time that lawmakers on the House Intelligence Committee reaffirmed the resolve to publicly release a potentially devastating report on politically charged government surveillance of the Trump campaign and transition by the Obama administration, lawmakers who have viewed the memo have suggested to Fox News. Lawmakers who have viewed the report are likening it to a “palace coup” and calling the contents “worse than Watergate.” The 4-page report may be released as early as next week.